There are professional bloggers, like Darren Rowse, [@Problogger.net], and Jeremy Schoemaker, [@Shoemoney.com], that have massive websites full of amazing content, but their impact on Pinterest is still relatively small. See Darren Rowse’s Pinterest Profile. [Jeremy Schoemaker doesn’t have one that I could find]. Additionally, you can see how many of their readers have taken the time to Pin one of their articles to Pinterest by looking at the ‘source’ date. [The Problogger.net source data] [The Shoemoney.com source data]. Reason #1: The Blog Posts Don’t Have Images. You’ll notice in the problogger.net source data that his headshot gets pinned frequently in association with random articles being mentioned in the comment field. That’s an indication that people are on an article they like and are hitting “Pin It” and being presented with a limited selection of images, his headshot being one of them, and so they go with that out of necessity. But headshots aren’t viral. Reason #2: The haven’t incorporated the Pinterest Social Media Sharing Buttons Yet. Lots of times big time bloggers, like big time companies are slower to adopt the social sharing icons for new social networks. That makes sense, and they have their reasons. But until they cross that bridge, they will be limiting their ability to get the easy wins. Reason #3: They haven’t fully ‘set up shop’ in Pinterest yet. In the case of Darren Rowse, he does have a profile set up. In the case of Jeremy Schoemaker, he doesn’t have one yet. So it makes sense that they have a smaller overall impact in Pinterest. At Liberty Jane Clothing, we had our Pinterest referral traffic double in the month after we set up our Pinterest profile. So there is no doubt that when these types of Professionals decide to turn on the Pinterest spotlight, it’s gonna really work well for them. 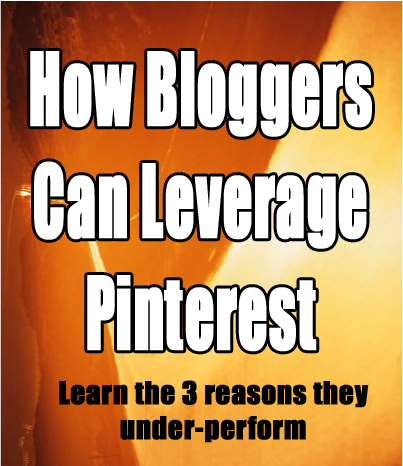 The Solution To Under Performing Pinterest Impact: If you could do 1 thing to revolutionalize the overall impact on Pinterest, it would be to go back through your posts and create some type of graphic that corresponds to the post – and insert it into the post so that your readers have something easily pinnable. I call this Pinterest Image Optimization. It’s hard work, no doubt, but it’s the effort that will enable your fans & followers to begin doing all the hard work, (although Pinning isn’t hard work), for you. Make something like the graphic I made for this post. So that’s it. Not rocket science, just adapting your amazing content to an amazing new social network.